Adhesion of Streptococcus mutans to monocyte cells is important because S. mutans can enter bloodstream and cause various systemic diseases. When entering S. mutans into the bloodstream, leukocyte cells will be responded. One of the immunocompetent cells which acts to prevent the spread of S. mutans to the systemic is monocyte cells. One that is thought to increase the adhesion of S. mutans to these monocytes is coffee beans. The role of coffee beans on dental caries is important because almost everyone in the world likes coffee, while coffee beans are rich in bioactive content which is thought to be used to prevent and treat dental caries. Lately, dental caries is a risk factor for systemic diseases. 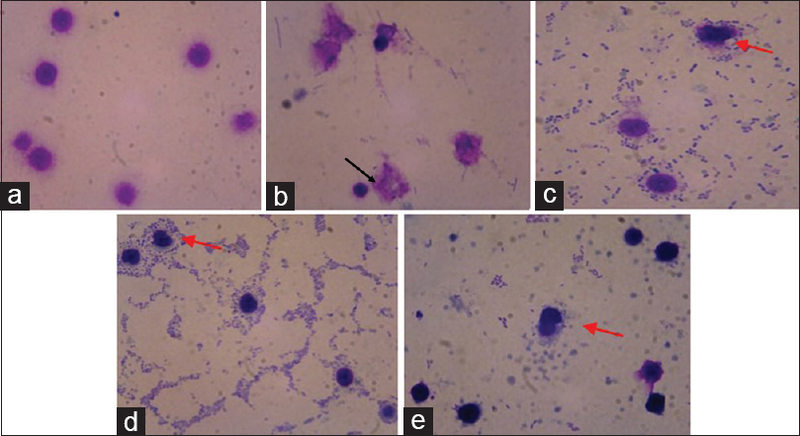 Bacteria (S. mutans) derived from dental caries play a role in the occurrence of endocarditis., Dental caries bacteria was found in coronary atherosclerotic plaque specimens in patients who died of a heart attack. S. mutans is a facultative anaerobic, Gram-positive cocci-shaped bacteria commonly found in the human oral cavity and is a significant contributor to tooth decay. The immune response of dental caries among others related to cytokines is expressed odontoblast layer, such as interleukin (IL)-1β, IL-1α, and tumor necrosis factor-alpha (TNF-α). It said the S. mutans is not an immunogen; therefore, S. mutans is an antigen that can be cross-reactions with the heart muscle, namely, cardiolipin (diphosphatidylglycerol); a phospholipid that is found in the membrane mitochondrial. At present, the prevention and treatment of a disease are more aimed at the host response. Apart from humoral, cellular responses also an important play role in dental caries. Humoral response was played by IgG and IgA, and the most cellular role is phagocytosis. The immune responses such as monocytes phagocytosis of dental caries associated with IL-1 β, IL-1α, and TNF-α. The initial process of phagocytosis is characterized by the adhesion of microorganisms on the cell surface. S. mutans comes into contact with such as monocytes. On the other hand, cavities should be prevented and treated for dental diseases most frequently encountered with the main causes of S. mutans.,,, The elements of a mobile that works on nonspecific immune system, which can be grouped in mononuclear phagocytes (monocytes and macrophages) and granulocytes (neutrophils, eosinophils, and basophils). These cells derived from multipotent hematopoietic stem cells located in the bone marrow fetal liver. Based on the functions, these cells are grouped into phagocytes, cells mediators, and lymphocytes. The role of these cells in the immune response can be seen in phagocytic activity and inflammation that are part of the innate immune response. Meanwhile monocytes are known to have receptors that can recognize S. mutans. The aim of this study is analyzing adhesion activity to monocytes against S. mutans with exposure steeping robusta coffee beans in vitro. This research has received a certificate from the ETHIC Faculty of Dentistry, University of Jember. Steeping coffee beans is made by mixing 200 cc boiling water with 6 g of coffee beans. Blood is obtained from a healthy woman (not suspected of suffering from systemic abnormalities, no carious teeth, and no calculus), not pregnant, not smoking, and not consuming alcohol. Peripheral blood sampling 6 cc added anticoagulants. Ficoll-hypaque (Sigma) was layered, centrifugated and suspended in medium Roswell Park Memorial Institute 1640 (Gibco). Added Hank's Balanced Salt Solution/Gibco 1:1, pipetted, centrifugeted. The cells were placed in 96-well microtiter plate 8 × 105 cells/well for 45 min at 37°C and washed four times with the medium. Attached is monocyte. Furthermore, the culture of monocytes and treated with the appropriate group (each consists of four samples). The control group – monocytes untreated; S. mutans group – monocytes + S. mutans; coffee group 2.5% – steeping coffee beans 2.5% + S. mutans; coffee group 5% – steeping coffee beans 5% + S. mutans; and coffee group 10% – steeping the coffee beans 10% + S. mutans. staining, and analyzed adhesion activity of under a light microscope with magnification 400 × on 100 monocytes. The data used in this study were tested for normality and homogeneity using the Kolmogorov–Smirnov test and Levene test. Hence, if the data are too large, the difference from the numbers obtained is not used. Data were analyzed using analysis of variance (ANOVA) followed by least significant difference (LSD) test. ANOVA analysis results Various concentrations of robusta coffee beans increase adhesion of S. mutans to monocyte cells [Figure 1], [Figure 2], [Figure 3]. The results of this study can be seen in the following figure. In the picture also seen several monocytes that lysis, especially in the S. mutans groups [Figure 1]b. Figure 1: The activity of S. mutans adhesion on monocytes after exposure with Robusta coffee beans. Until now, various studies proved that the positive and negative role of coffee on health. One of the negative effects of steeping coffee beans is causing discoloration of the teeth. In addition, it causes side effects, namely, hypertension (still under debate). On the other hand, Song et al. proved that coffee intake is a risk indicator for tooth loss. Therefore, scientists are still trying to isolate bioactive ingredients that do not have negative effects, but the presence of various bioactive ingredients is thought to also be complementary. In this study, we proved that in gated adhesion activities of coffee groups 10% lower than the ingestion activity coffee groups 2.5% and coffee groups 5% [Figure 1], [Figure 2], [Figure 3], allegedly because of the number of bacteria have been reduced in number. S. mutans groups many died allegedly due to the load cell is too heavy because of the many bacteria [Figure 1]b. Besides that, there is no additional protection on the cell. In contrast to coffee groups that get additional protection from bioactive components of coffee beans. Coffee Groups 5% seen monocytes enlarged allegedly not optimally protected by coffee beans because the dose is small. Hence, after menfagosit monocyte cell lysis approached, while the coffee groups 5%, and coffee groups 10%, monocyte cells appear normal because these cells are protected by coffee beans (concentration greater than S. mutans groups). Besides, in coffee groups, 10%, also seen the number of bacteria less allegedly concentration of coffee beans was higher than other research groups. This was presumably due to the content of the coffee beans that also have antibacterial, so many dead bacteria. Based on the results of this study, we recommend choosing green coffee beans because they do not cause black teeth. Sugarless coffee will be better because it can prevent the occurrence of dental caries. However, for connoisseurs of black coffee, we recommend gargling to prevent the black color. In the future, we will use these coffee beans to make mouthwash and toothpaste for the prevention of dental caries. Certain concentrations of steeping Robusta coffee beans consumption increases adhesion activity to S. Mutans, where the highest concentration of 5% increases adhesion activity of monocytes. We are grateful to RISTEKDIKTI was funded this research, and we are also grateful to the Chair of University of Jember LP2M for recommending this research. Lockhart PB, Brennan MT, Thornhill M, Michalowicz BS, Noll J, Bahrani-Mougeot FK, et al. Poor oral hygiene as a risk factor for infective endocarditis-related bacteremia. J Am Dent Assoc 2009;140:1238-44. Nobbs A. Getting to the heart of the matter: Role of Streptococcus mutans adhesin cnm in systemic disease. Virulence 2017;8:1-4. Nomura R, Ogaya Y, Nakano K. Contribution of the collagen-binding proteins of Streptococcus mutans to bacterial colonization of inflamed dental pulp. PLoS One 2016;11:e0159613. Hahn CL, Schenkein HA, Tew JG. Endocarditis-associated oral streptococci promote rapid differentiation of monocytes into mature dendritic cells. Infect Immun 2005;73:5015-21. Santiago KB, Conti BJ, Cardoso EO, Golim MA, Sforcin JM. Immunomodulatory/anti-inflammatory effects of a propolis-containing mouthwash on human monocytes. Pathog Dis 2016;74. pii: ftw081. Engels-Deutsch M, Pini A, Yamashita Y, Shibata Y, Haikel Y, Schöller-Guinard M, et al. Insertional inactivation of pac and rmlB genes reduces the release of tumor necrosis factor alpha, interleukin-6, and interleukin-8 induced by Streptococcus mutans in monocytic, dental pulp, and periodontal ligament cells. Infect Immun 2003;71:5169-77. Abbas AK, Lichtman AH, Pober JS. Celluler and Moleculer Immunology. 8th ed. Philadelphia: W. B. Saunders Company; 2015. Preetham K, Vijayawada N. Harmful Impact of the Caffeine in the Oral Cavity. Int J Dent Oral Health 2017;3:45. Kayalvizhi G, Suganya G, Subramaniya RB. A cuppa for caries free teeth? Int J Contemp Med Res 2014;1:19-27. Wijaya W, Ridwan RD, Budi HS. Antibacterial ability of arabica (Coffea arabica) and robusta (Coffea canephora) coffee extract on Lactobacillus acidophilus. Dent J (Majalah Kedokteran Gigi) 2016;49:99-103. Song IS, Han K, Ryu JJ, Choi YJ, Park JB. Coffee intake as a risk indicator for tooth loss in Korean adults. Sci Rep 2018;8:2392. [DOI: 10.1038/s41598-018-20789-0]. Mardiati E, Aryati E, Wiradona I, Santoso B. The effect of black coffee and tea consumption to saliva degree of acidity in preventing tooth decay. ARC J Dent Sci 2017;2:11-3. Roedy B. Immunomodulatory Potential of Robusta Coffee Beans against Dental Caries Competing Grants. Hibah Bersaing. Inpres; 2015. Scalbert A, Williamson G. Dietary intake and bioavailability of polyphenols. J Nutr 2000;130:2073S-85S. Dupas CJ, Marsset-Baglieri AC, Ordonaud CS, Ducept FM, Marie-Noëlle M. Coffee antioxidant properties: Effects of milk addition and processing conditions. Issue J Food Sci 2006;71:S253-8. Natella F, Nardini M, Belelli F, Pignatelli P, Di Santo S, Ghiselli A, et al. Effect of coffee drinking on platelets: Inhibition of aggregation and phenols incorporation. Br J Nutr 2008;100:1276-82. Sri MS. Coffee, Brew, & Health. Jember: Indonesian Coffee and Cocoa Research Center; 2015. Editorial Health Secret. Efficacy of Bombastic coffee. PT Elex Media Komputindo. Jakarta; 2010. Nugroho YA. The effect of giving a combination of betel fruit (Piper betle L) fruit, miyana leaves (Plectranthus scutellarioides (L.) R. BR.) leaf, honey and egg yolk to increase phagocytosis activity and capacity of macrophage cells. Media Litbang Kesehatan 2012;22:1-5. Dennehy KM, Willment JA, Williams DL, Brown GD. Reciprocal regulation of IL-23 and IL-12 following co-activation of dectin-1 and TLR signaling pathways. Eur J Immunol 2009;39:1379-86. Netea MG, Gow NA, Munro CA, Bates S, Collins C, Ferwerda G, et al. Immune sensing of Candida albicans requires cooperative recognition of mannans and glucans by lectin and Toll-like receptors. J Clin Invest 2006;116:1642-50.